This was fun. It usually is. It felt authentic. 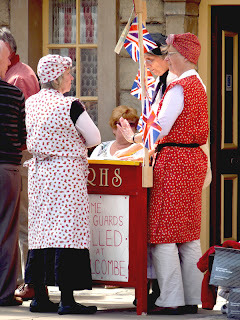 So many people were dressed the part – and very convincingly at that, that we were all back there. I was even wearing one of the vintage dresses I picked up at the same event last year. I picked up a beret to supplement my outfit. The stations were rigged out as well – windows were taped and a resistance-run French café was created from the shelter at Ramsbottom station. The full event takes place over this bank holiday weekend – 25, 26 and 17 May 2013. 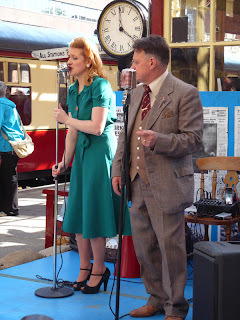 · Paul Harper and daughter Natasha singing 40s favourites at Bury station. 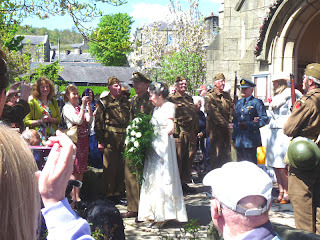 · Renewal of Vows at St Paul’s Church, Ramsbottom. 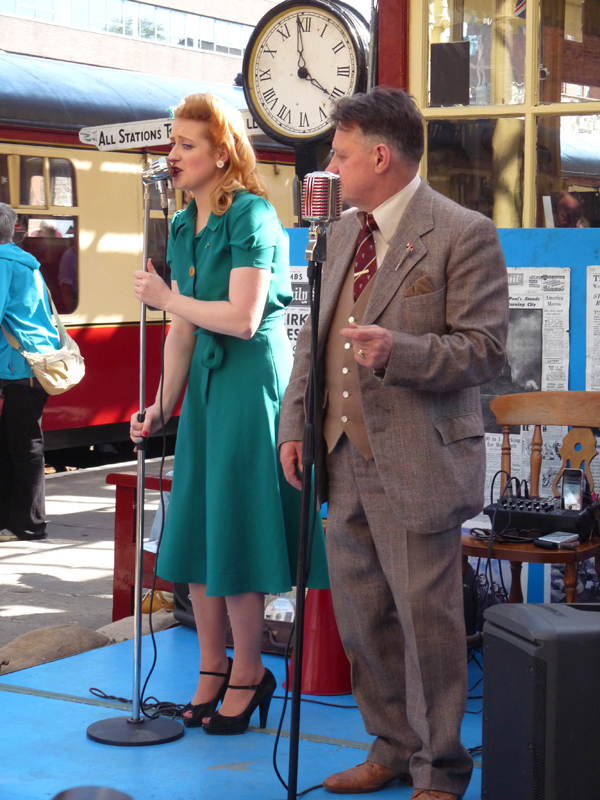 · Listening to Katie Spitfire at Ramsbottom station. · Firepower action at Ramsbottom station. Maybe some authenticity came in a conversation we had with another baby boomer couple. Note: the World War II generation is dying out. Those who were children born in the war or shortly after are the ones who remember though now it is second-hand. We all had ration books – for some items until as late as 1954. I remember children who went to school without shoes and the teacher asking if anyone had some wear left in any they had grown out of, and could this family have them. I didn’t feel poor when I was a child – after all we lived in a semi-detached council house that had a nice garden. My maternal grandmother and grandfather ran a greengrocer’s shop in an area of terraced houses, some of them back-to-back. They seemed poorer because of where they lived but were in fact richer; they were amongst the first to get a television and they went on touring holidays every year, staying in very nice hotels. We struggled to buy a few sweets or a bar of chocolate on a Friday night, though we did manage a fortnight at the seaside every year but only because we lived with my paternal grandmother so my mum could use for holidays all the money she’d saved towards putting a deposit on a house. By the time I went to university in 1970, I’d buy a chocolate bar if I wanted to. No, we didn’t feel poor but we were certainly much worse off than most people today. Make do and mend still went on during the 1950s and the lady to whom we talked told us about the winter coats bought every couple of years that were passed down through seven daughters and then cut up to make a coat, leggings and a muff for the toddler. There was an exhibition of war time cooking, showing how people made the most of the small quantities of the items that were rationed and of the items that were more readily available. Eggless cakes go stale quickly, apparently. One made just yesterday, and fine then, was inedible today. I guess, though then it wasn’t a problem then: food was scarce and people working so hard that they got hungry – nothing would need to last overnight. Did any of this help me with this project? Yes, it think it did. 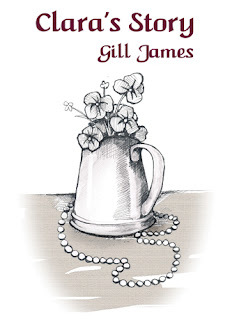 There were a few reminders of the details – the seamed stockings and in some cases the cold-tea stained legs with the eye-liner seam drawn on. Most of the women carried baskets. Stations tended to be full of soldiers. And the dresses- oh the dresses. Yes, my young ladies now in their early 20s, dressed like that also when they met up again 1947. They had become smart young women by then. One of the greatest delights was the Ramsbottom War News, published by the Ramsbottom Heritage Society. This year it contained a collection of articles printed in the Ramsbottom Observer in 1942. Like The War Papers to which I referred often, so much of what life was like can be gleaned from the smaller articles and the advertising. A particular one caught my eye – an advert for cross children. It blamed the crossness on “a sluggish system clogged with sour waste matter” and claimed that this “evil” could be corrected with a good dose of California Syrup of Figs. If only! Labels: Bury, California Syrup of Figs, East Lancs Railway, Natasha Harper, Paul Harper, Ramsbottom Heritage Society, Ramsbottom News, Ramsbottotm, rationing, St Paul's Church, war time cooking.